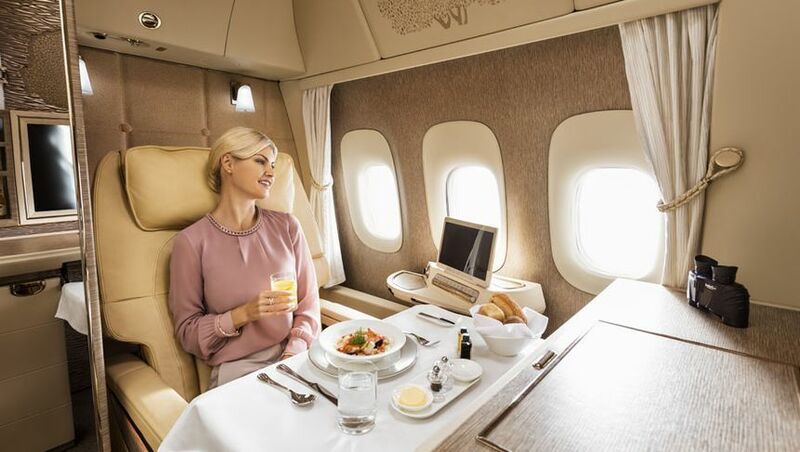 Emirates' new first class suites for its Boeing 777 and Airbus A380 fleet bring new levels of personalisation and service to the highest of high flyers. 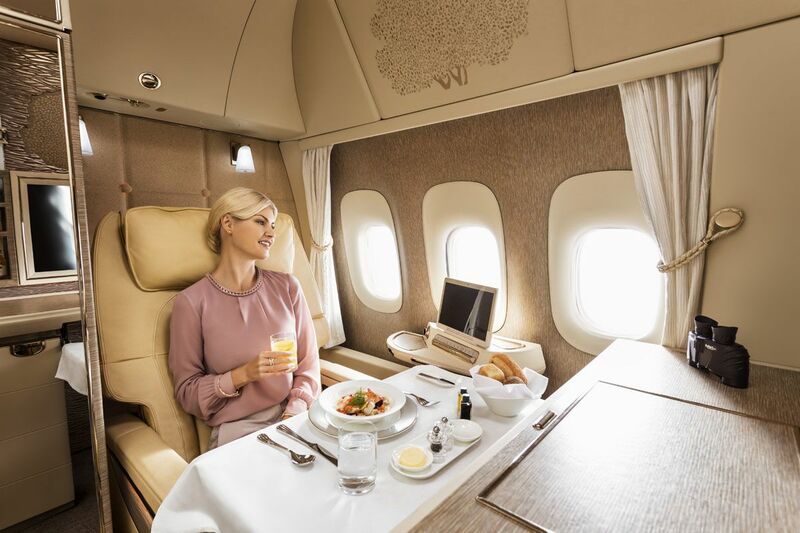 First and foremost, each suite is literally a private room: not just with sliding doors as in Emirates' current first class, but cocooning travellers within floor-to-ceiling cabin walls for complete privacy. Emirates CEO Tim Clark previously alluded to this, drawing comparisons between the suites and a "private railway carriage" – but train travel was never quite like this! 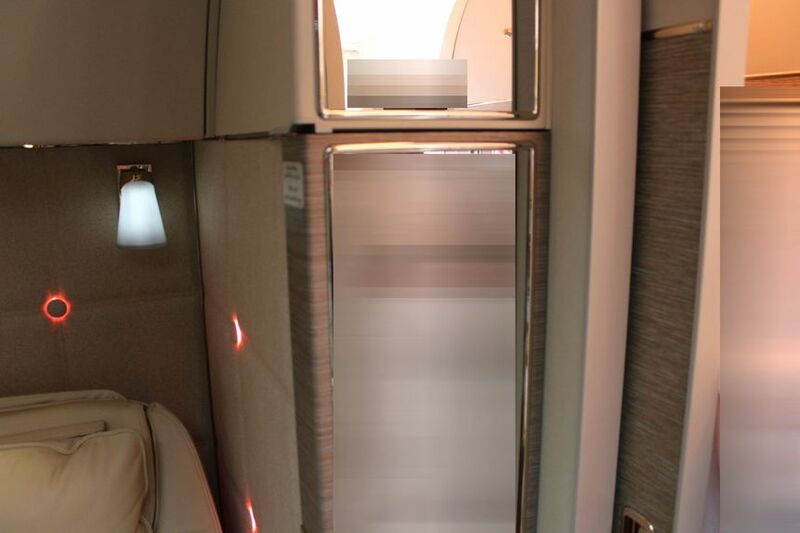 “Emirates pioneered the First Class private suite concept back in 2003, and today it’s the industry benchmark when it comes to first class travel," Clark says, describing the 3.7m² (40ft²) suite as "a real game-changer in terms of privacy, comfort, and thoughtful luxury." For instance: instead of conventional window shades, there are stylish curtains. Want a bite to eat or a Champagne top-up? There's no need to press a call button, let alone open your door - you'll instead be able to video chat with the cabin crew to place your order, which will then be delivered to your tray via a hatch in the wall (the panel on the right), making the experience less like a commercial airline and more like a private jet. The new Boeing 777 first class cabin adopts a 1-1-1 layout with six suites overall, down from eight at present in a 1-2-1 configuration. The cabin immediately impresses with its redesigned 'cathedral-like' ceiling and creatively-used lighting. The temperature inside each fully private suite can be dialled up or more likely down to suit your preference (LED lighting is likewise tailored for your taste), and when the seat is converted into a fully-flat bed it closer to the windows so that you can stand aside and change into your pyjamas without a visit to the bathroom. Speaking of windows, the two first class seats located in the centre of the cabin will feature 'virtual windows', with external cameras fitted to the aircraft delivering real-time vistas taken from the left- or right-hand side of the jet - and of course, you can choose which 'view' you'd like to see. ... while everybody gets a set of Bowers & Wilkins noise-cancelling headphones to use with their 32 inch LED-backlit HD video screen. 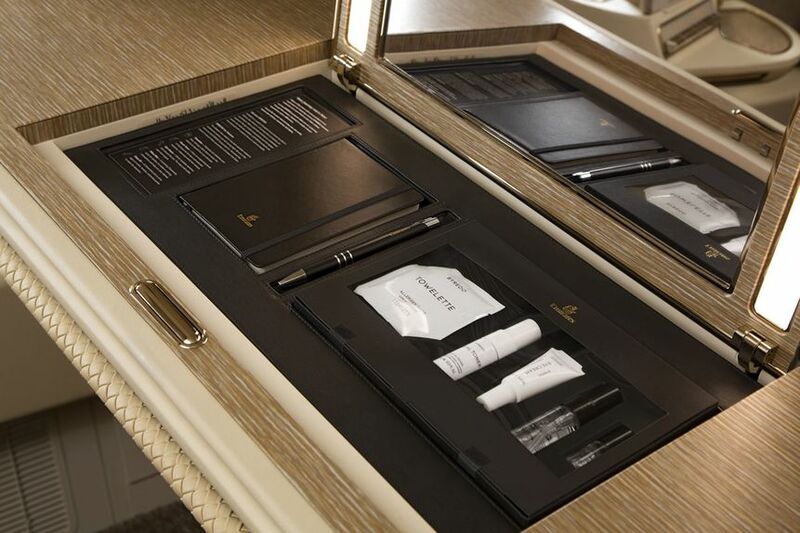 Another nod to the old world era of luxury travel: record your sky-high musings in a leather-bound notebook, which is concealed in this 'inspiration kit' bureau alongside Byredo facial toner, eye cream, sleep oil and pillow mist. Emirates' new Boeing 777 first class suites will debut on flights from Dubai to Brussels and Geneva from December 1 2017; Clark also name-checked Chicago, Brisbane and Perth as possible candidates for the new birds in 2018. 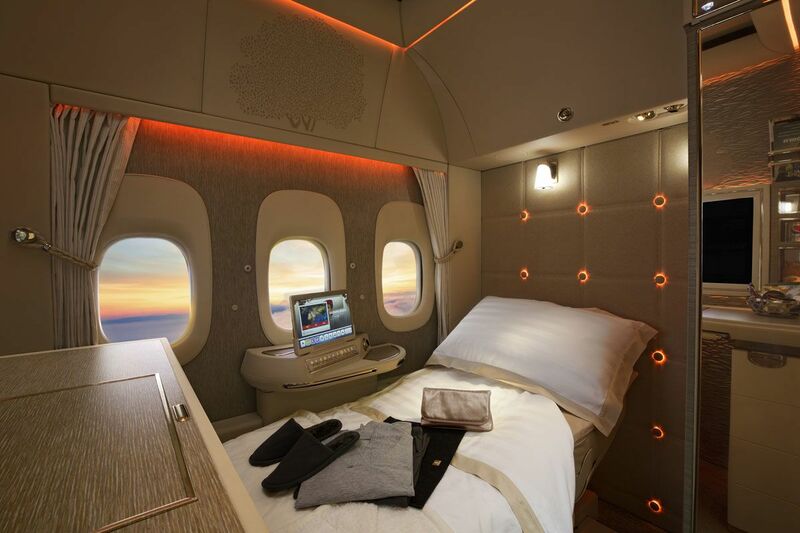 Further down the track, these suites will also make their way onto Emirates' Airbus A380 superjumbos. 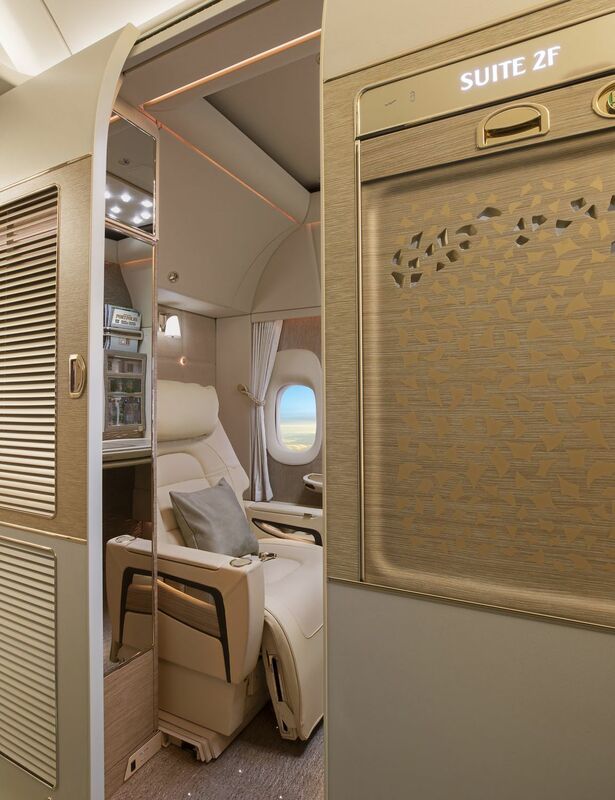 Australian Business Traveller stepped on board the first of Emirates' new Boeing 777 jets in Dubai for a full tour of the first class cabin. When the door closes, large mirrors will help you check you're looking your best. 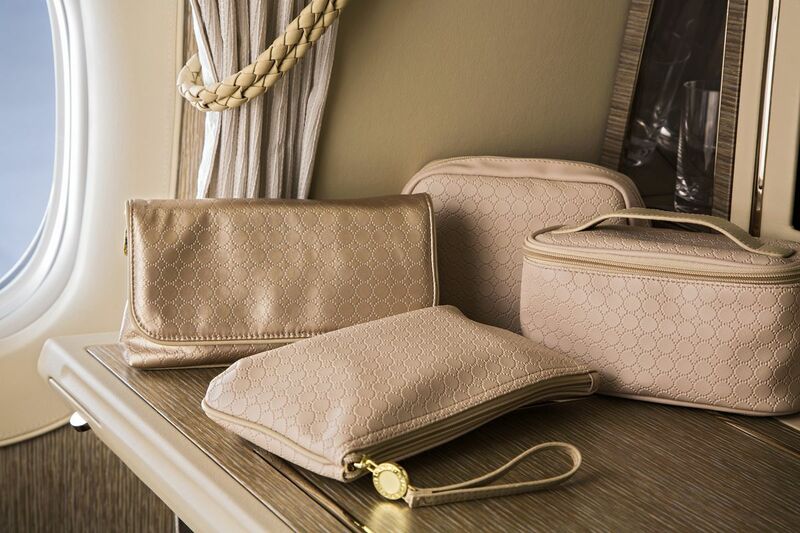 These are also useful later in the flight when changing out of the supplied pyjamas into your normal clothing, as there's plenty of room to do this within the suite itself, not to mention the privacy as well. ... and while you wouldn't normally expect to have windows when sitting in the centre (suites 1E and 2F), you actually do... well, as close as you can get to the real thing. In the photos above and below, these are 'virtual windows': display monitors in the shape of traditional aircraft windows, but with in-built screens as opposed to regular glass. 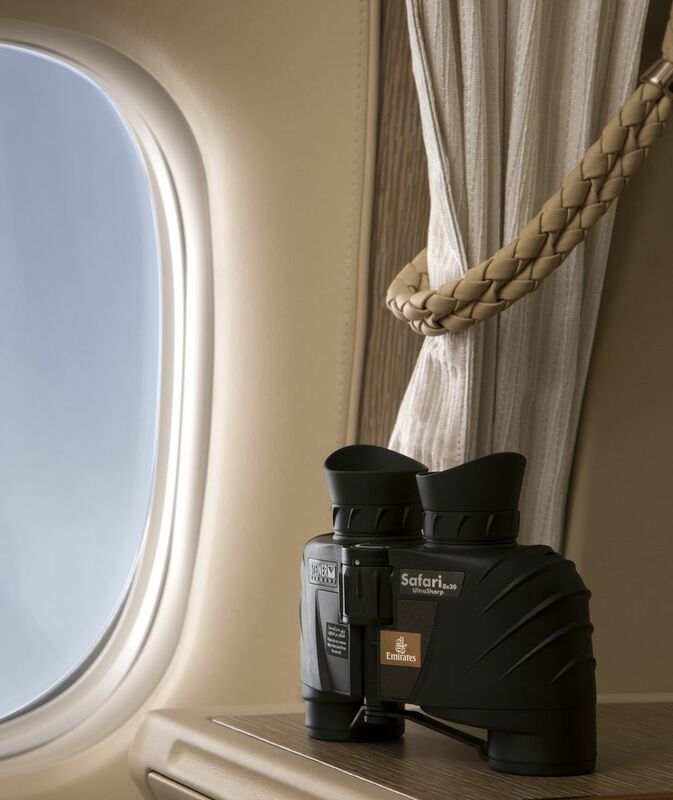 Cameras on the outside of the aircraft send in live pictures of the view, and these screens display that view at life-like quality. ... it also allows you to adjust the temperature of your personal suite, and the lighting theme too. ... red, or any of the other colour options, the decision is yours. You can adjust the brightness in addition to the colour itself, so if you find that the armchair light is giving a reflection on your smartphone or laptop screen, you can dim it. Flick that armrest open and you'll discover a remote control for the inflight entertainment system, but you can also use the tablet to choose your preferred movie, TV show or aircraft camera view, or even to video call 'room service'. We put the system to the test: the video link worked well and we could hear our flight attendant without needing to don any headphones, so if you've awoken for a midnight snack, you can simply grab the tablet and call. ... but if you press the button on the leading edge, the top pops up to reveal another compartment, not unlike a briefcase. ... as does a mini bar. However, this isn't refrigerated, so unless you just want a quick sip of water or are happy to have a room temperature soft drink or juice, you're better off just calling room service. 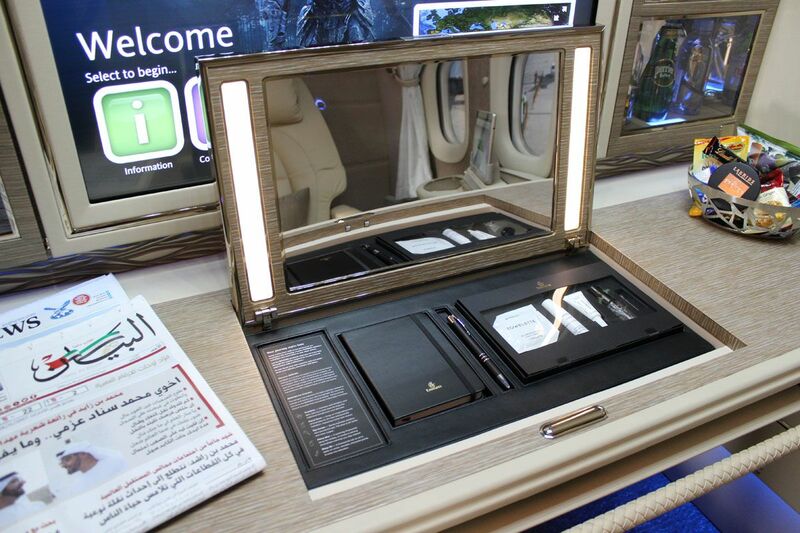 That said, we're happy that Emirates has included two magazine holders within the suite, which avoids what sometimes feels like an excessive number of visits from the crew before take-off, where multiple crew members stop by to offer magazines and newspapers on a tray. Now, they're all at your fingertips, which should help get your journey off to a more relaxing start. ... but if you'd like to sleep, just ask the cabin crew to make your bed. That said, you can also sit up in bed and watch TV, if you need a bit of time to relax before your shut-eye. Travelling with a partner? They can certainly pop into your suite a visit, as there's sufficient sitting room, but these are only single beds – there are no 'adjoining' suites in the first class cabins of the Singapore Airlines or Etihad Airways Airbus A380s. 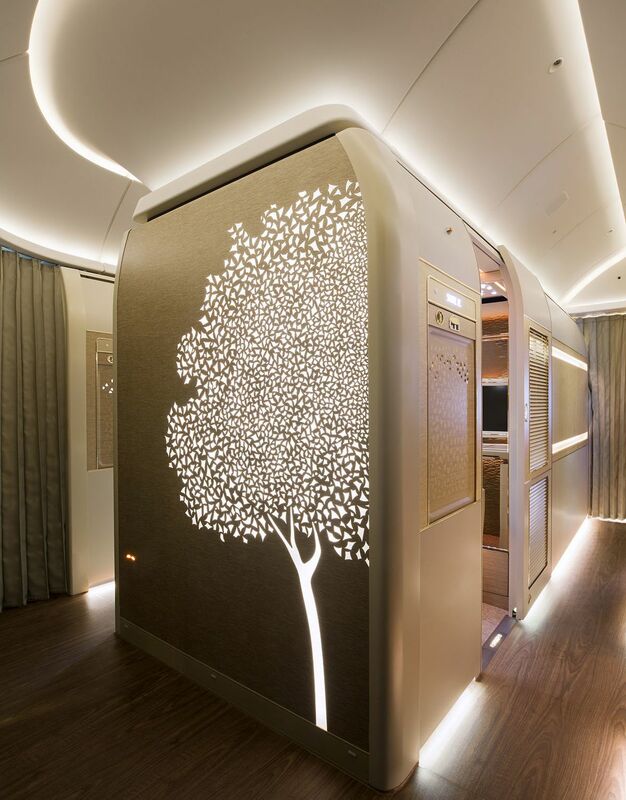 But just in case you think of cosying up, Emirates President Sir Tim Clark cheekily points out that, "the suite's side panels have little apertures that the crew can use to see that you're... 'asleep'." "The doors are easily opened," he added, "but generally, people behave." Want to see more? Join us for an exclusive walkthrough of Emirates' Boeing 777 first class cabin by watching the video below. Chris Chamberlin is visiting Dubai as a guest of Emirates. PREVIOUS, November 9 2017 | Emirates will unveil an all-new first class suite at the Dubai Airshow on Sunday November 12 for its Boeing 777-300ER jets, but has dropped a few sneak peeks online ahead of the launch. 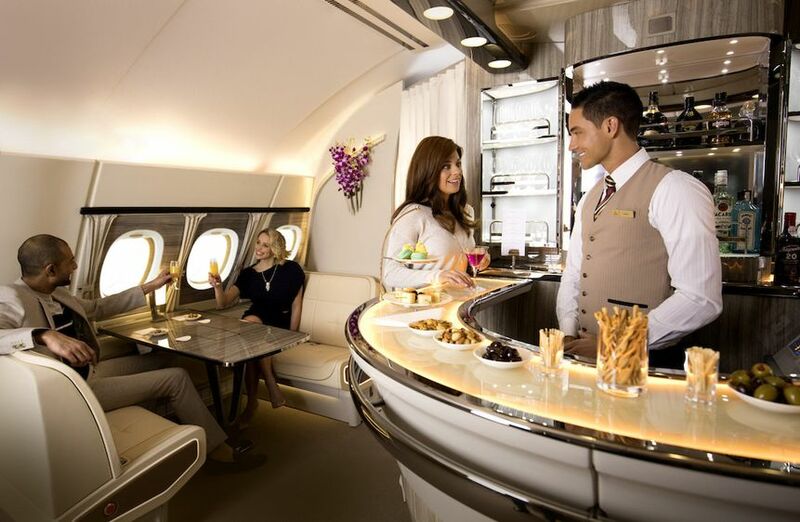 … reflecting the more sophisticated contemporary palette of Emirates’ recently-revamped Airbus A380 inflight bar (below) rather than the heavier ‘bling’ aspects of heavy brass and faux ‘burled walnut’ which feature prominently on the airline’s current jets. … which may allow travellers to customise the lighting colour above and around their suite, as hinted in this final glimpse. 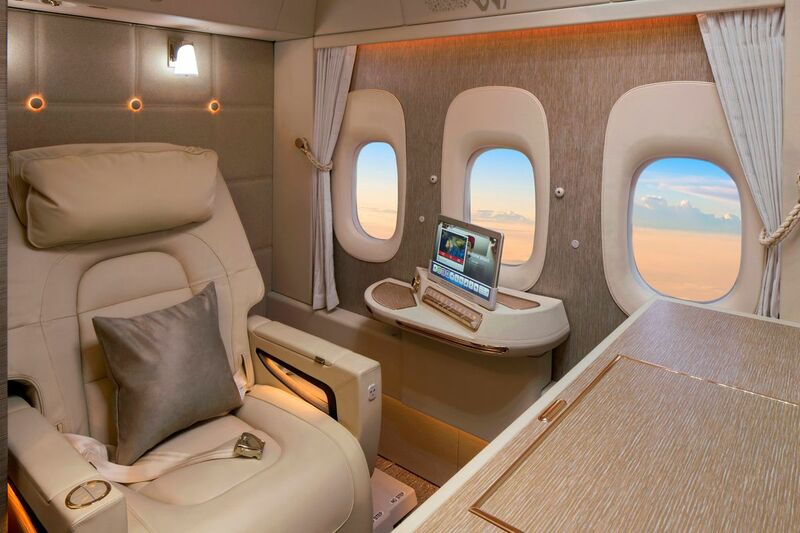 Australian Business Traveller will attend Dubai Airshow as a guest of Emirates, where Emirates President Sir Tim Clark will unveil the seat before passengers get their first chance to experience it on flights next month. I'm glad its not as gaudy as the usual F suites. There is just too much gold around. Those switches... it's almost like the first class passengers are flying the plane. There's more at the seat then in the cockpit. The 80s is back. Straight out of an episode of Dynasty. Can't wait to see it and then fly it! Chris is it you I’ve spotted in the syd Emirates lounge? Are you on your way to review Emirates new fc? Only just spotted your message, but it was lovely to meet you (assuming you're the guy who came up and said hello - in which case, enjoy Bangkok!). My radar hit on the binoculars. What's with the binoculars? Some thoughts. These look fantastic. Especially the separate climate controls. Along the same vain as Etihad's Apartment but with no Separate chair and bed. Both look like excellent products. Looks like the new Singapore Suites will get the Double Bed Suite advantage. Shame Emirates for still going with a 2,3,2 Business Class config. in 2017. 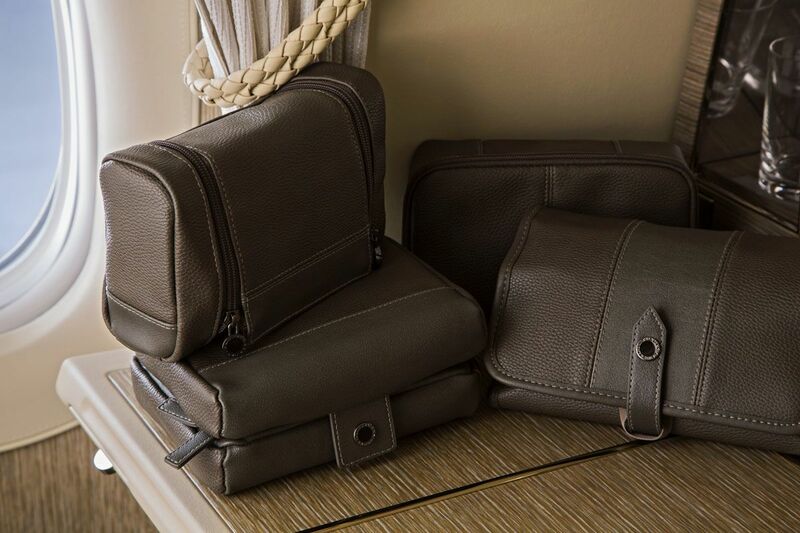 The best business product to me still looks like the Qatar Q-Suites. A great product from the EK boys; the ceiling to wall feature is world class. Chris - I must correct you when you said "but train travel was never like this". Luxury carriages from as far back as the 19th century were at least as luxurious (certainly less gaudy) and far more spacious than any first class suite in the sky. Looks absolutely fabulous... much more classy than today's suites and a true private room - wow. Looking forward to trying it out. so which has the edge with their new F.. EK or SQ? It looks amazing, I have only had the good fortune to fly Emirates once due to a medical emergency while on a rare holiday overseas. I was overwhelmed with the elegance and 1st class feeling while in Business class so can’t I,amine how much better that can be. One day I would love to fly Emirates again, in my dreams maybe. Oh, I do like this! Tim Clark says 8-9 planes will be done max and Australia will be getting one of the refits. Tim Clark- Possibly Brisbane, Possibly Perth. Thanks Chris for asking about Adelaide as well in the question but those were the only 2 possible destinations he replied back with. Holy crap, this is gorgeous. So what SQ's new Suites product should've been. They should be quaking in their boots now. Qantas fades far far away even more now with it’s less is more cheap boring drab F Class. Let’s hope the refurb is worthy. Really interested to see how the virtual windows will work in practice, As this is the one element of the re-design which seems innovative. It may also be the pictures, but I am not seeing where this "ample sitting room" is if your travelling with your partner. In fact I do not see how these would work for couples at all given the high walls and the 1-1-1 layout. When the seat is in bed mode, you can sit on it next to each other as you would a bench, as there's ample legroom for two people on the side (unlike some first class suites where there's no room 'next' to the bed). The SQ suite gets my vote for understated elegance and a seperate bed. Not sure why in first class you’d need you’d own fridge on EK that’s not even chilled? oh wow this looks amazing,haven't seen photos of the bathroom/shower yet. The full privacy is a real clincher for me. This is what I was hoping the new SQ suites would be like in terms of finish, colour palette, features etc. In toning down the 'bling' factor, EK aesthetics have moved a step closer to what SQ could/should have been. In turn, SQ have moved from fab to almost drab. Well done Emirates, well done. Emirates and Singapore airlines won't be able to keep up with the demand, all the others will fly near empty. I love the idea of breakfast served through a slot in the wall. You need to stay in 1970s motels to get that now! Oh great memory, use to love those wooden two-way slots where they pushed the breakfast tray through, after you filled at the card and hung it on the door the night before. Just loving the heavy Roman curtains!! So OTT!! Flying DXB to Madrid in First next April. Fingers crossed it's as classy as this. All very attractive indeed. I would be more impressed with good old fashioned service levels returning. Perhaps a moment of thought for airline management teams to ponder. I love EK and fly with them in first AUtoEU twice a year in first. I have also flown Etihad Apartment last year. This looks amazing, however they have again made the same mistake as the previous design. That stupid desk only gets in the way, especially if you are extra tall like me. It prevents from a second person dining with you...one of the joy is sitting across from your partner and enjoying the excellent service and food offered on board. qantas has this, although the airline offering is third class. Etihad allows for you to sit across from one another... in fact three of you can dine. The Etihad ottoman, and the exisiting EK seat are narrow if you are large. From the photos the Singapore first bed (new) and this one seem to be narrow as well. Why oh why are their inches of spare space on either side of the chair...a super wide flat bed beats led lights, serving panels, fridges, or curtains. Usable ottoman, wider seats and you will have everyone beat. In comparison, Air Frances First Class product is difficult to beat when it comes to a full unclutted bed to sleep, with no shelf to restrict your legs. Room to move and abmiance. Though no bar offering, cabin and bedding arrangment makes up for it - also the drawn curtain is a suttle touch from days of old - my views anyway! Hi all, I'm booked on the Syd Christchurch first class in April, then the last Emirates a380 flight from Christchurch back to Sydney in business, what are the chances of getting the new cabin? Does anyone know if EK415/416 have the new First? 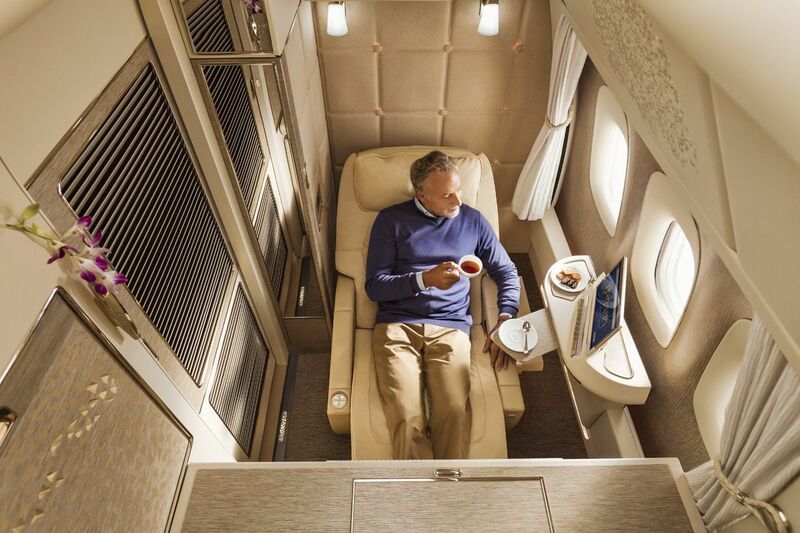 Comment on "Photo tour: Emirates' all-new luxury first class suite"